Rickie Fowler is one of the coolest and most highly-recognized golfers on the planet! The fact that he is on PUMA staff only heightens his popularity thanks to their trend-setting styles. Please see below for their latest press release. CARLSBAD, Calif. (March 27, 2017) – When it comes to the first major of the year, Rickie Fowler will be dressed to the nines each day in apparel from PUMA Golf’s Spring Summer ‘17 Collection. On Thursday, Rickie will be outfitted from head to toe in a custom Flagstick Camo Collection that will be sure to help him stand out from the competition. PUMA’s apparel and footwear teams designed The Flagstick Camo Collection in celebration of the first major of the year, with each piece featuring a one-of-a-kind camo pattern inspired by the shapes and sizes of the iconic golf course greens. One of Rickie’s signature GoTime caps ($28) with a PWRCool, moisture-wicking sweatband. The Flagstick Camo Polo ($75) features a stylish, tailored fit polo with a camo print pocket, low-profile, button-down collar and trims. Flagstick Camo Pant ($90) incorporates the cool camo pattern at the side and back pocket. Flagstick Camo Short ($75) for the warmer days on course. IGNITE Spikeless Sport DISC ($140) a LE version of the brands IGNITE Spikeless Sport footwear, designed with the unique camo pattern. (Rickie will wear custom camo hi-tops for his first round). 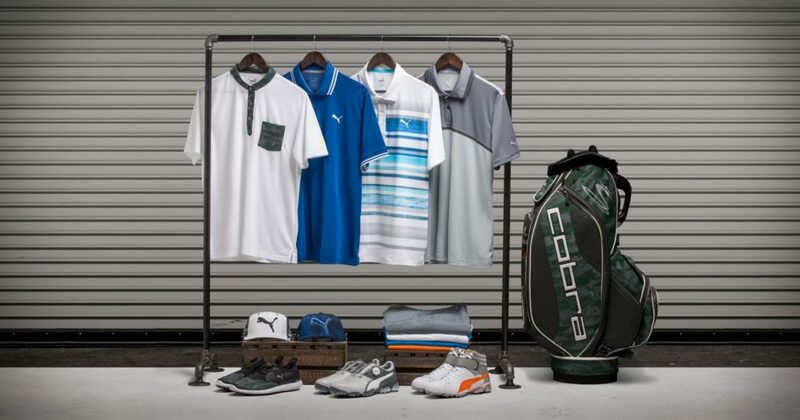 View the SS’17 collection here: http://www.cobragolf.com/pumagolf/collections/ss17.